A hen requires 24 to 26 hours to produce an egg. 30 minutes later, she starts all over again. The eggshell may have as many as 17,000 tiny pores over its surface. Through them, the egg can absorb flavours and odours. Hens with white feathers and ear lobes produce white shelled eggs. Hens with red or brown feathers and red ear lobes produce brown shelled eggs. The difference between brown and white-shelled eggs is the breed of hen. Breeds with white earlobes (and feathers) lay white eggs; breeds with red earlobes (and brown feathers) lay brown eggs. 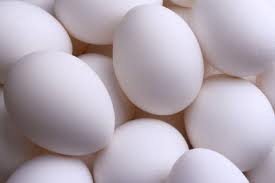 Both white and brown eggs have the same nutritional qualities. As a hen ages, her eggs increase in size. Small eggs come from young hens, while jumbo eggs are laid by older hens. Occasionally, a hen will produce double-yolked eggs. It is rare, but not unusual, for a young hen to produce an egg with no yolk at all. The little white ropey strands in an egg white are called “chalaza”. Their function is to anchor the yolk in the center of the egg. They are neither imperfections nor beginning embryos, and are completely safe to eat. In fact, the more prominent the chalazae, the fresher the egg! Nobody really knows when the first fowl was domesticated, although Indian history places the date as early as 3200 B.C. Egyptian and Chinese records show that fowl were laying eggs for man in 1400 B.C. It is believed that Columbus' ships carried the first of the chickens related to those now in egg production to this country. Yolk colour depends on the diet of the hen. Natural yellow-orange substances such as marigold petals may be added to light-colored feeds to enhance colours. Artificial colour additives are not permitted. The egg shell accounts for about 9 to l2% of its total weight. The shell is largely composed of calcium carbonate (about 94%) with small amounts of magnesium carbonate, calcium phosphate and other organic matter including protein. Shell strength is greatly influenced by the minerals and vitamins in the hen's diet, particularly calcium, phosphorus, manganese and Vitamin D. If the diet is deficient in calcium, for instance, the hen will produce a thin or soft-shelled egg or possibly an egg with no shell at all. Shell thickness is also related to egg size, which, in turn, is related to the hen's age. As the hen ages, egg size increases. The same amount of shell material which covers a smaller egg must be ‘stretched’ to cover a larger one, hence the shell is thinner. Eggs are an important source of complete protein for vegetarians. One egg = 1 ounce of lean meat, fish or poultry.